I really don’t want to be spending a lot of time in the kitchen these days. It’s warm, I’m exhausted a lot, and I would much rather be writing. Seriously. There are days it takes all I have to tear myself away from my writing. I went to sleep last night still writing in my head. Go figure that I woke up in the middle of a dream that could be a scene for what I’m working on. I blame my friend, Katie, for that. She kept asking for more of my short fiction series on Chocolate Wasteland. I resisted because I liked where I ended it. Then my imagination took her request and ran with it. So here I am writing more about J.D. and Ariana instead of editing/re-writing my book. Remember, it’s all Katie’s fault. If you read my last post, today I’m keeping it light both in tone and in the recipe. I made this radish salad to go with a rich Red Snapper dish I made one nice. The crispness of the vegetables and the acid from the dressing were a nice counterbalance to the richness of the fish. Chaz even liked it better than the fish. Admittedly, the fish didn’t even look like the picture for the recipe I followed. I cooked that thing to perfection though. That Red Snapper melted in my mouth. Back to the salad. I intended to use the radish greens, but they went bad FAST. The dressing is simple because I added fresh cilantro to the salad and didn’t want a lot of flavors fighting with each other in the salad and with the snapper dish. The most difficult part of this salad, slicing up the radishes. 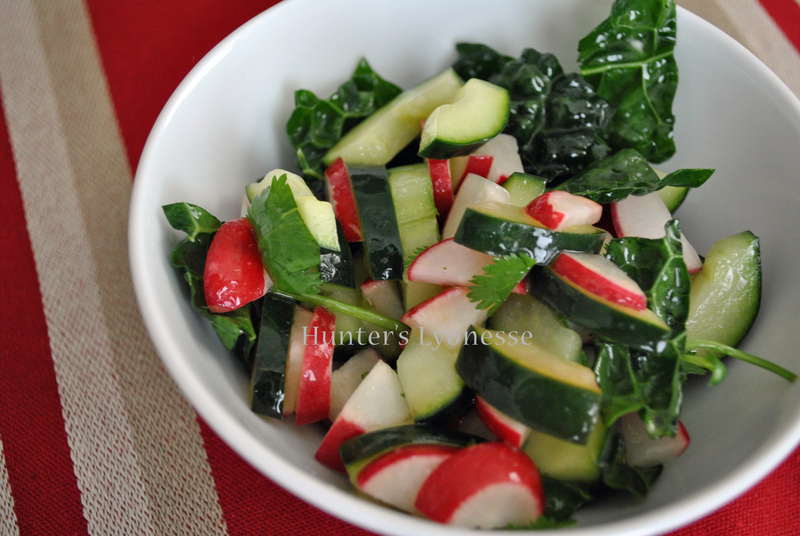 Place prepped radishes, cucumber, greens, and cilantro in a medium bowl and give a light toss. In a small bowl add olive oil, lime juice, and salt. Whisk together until emulsified. Pour over the radish salad and toss well. This post is linked to Raw Foods Thursdays at Gluten-Free Cat, Whole Food Fridays at Allergy-Free Alaska, Wellness Weekends at Diet, Dessert and Dogs. This entry was tagged Cilantro, cucumbers, dairy-free, egg-free, gluten-free, lacinto kale, Lime, olive oil, peanut-free, radish greens, Radish Salad, radishes, soy-free, yeast-free. Bookmark the permalink. This salad sounds so refreshing. I’m highlighting it at Raw Foods Thursdays tomorrow. Hoping the farmer’s market has radishes this Saturday! Glad you are an inspired writing machine!! !